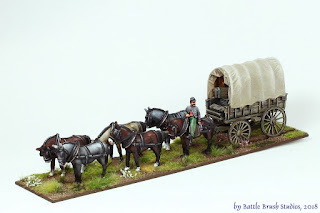 Today I would like to share some photos of the Perry miniatures Six Mule Wagon, supplying my little Confederates in the field. 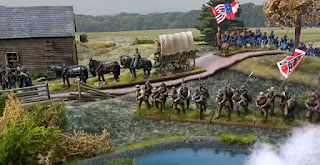 A few weeks ago we had a pretty cool American Civil War gaming event. Leading up to this I quickly painted up this supply wagon. It didn't have any in-game role, it basically stood at the sideline, looking nice. Which is all I had in mind for it really, and it did the job well. Then I added some random stowage I had at hand. Basically just two plastic Renedra barrels and two or three blocks of balsa wood. Really quick and dirty stuff, just so you'd see something in there if you happened to look inside. Adding the tarpaulin was a bit of a challenge. I used the old paper tissue and watered down PVA again, because that never let me down. First I tried a single layer of paper tissue sprayed with PVA/water which resulted in all kinds of trouble, then I gave it another try with a less subtle approach: two layers soaked in PVA/water mix, applied and then cut and shaped to fit. Very crude stuff, but it worked okay. I painted the wagon in no proper regulation paint, making it very much a confiscated civilian wagon. Again, nothing with much 'in game use', but it's so pretty and just adds to the look of the whole affair. Hope you like it! Very nice job on the wagon except that it is the wrong color. 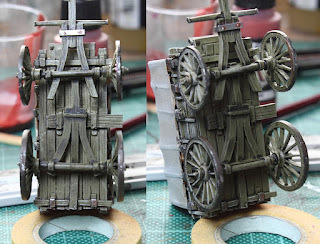 The wagon box was painted a light flat blue and all the the running gear and wheels were painted an iron oxide red. Thanks for the comment, Unknown. Wasn't that how Union wagons were painted?